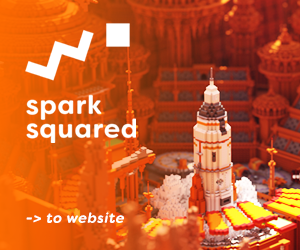 Thanks for 300 downloads! The mod is also featured on the mods page! I'll keep updating the mod and making it better! A lot of new things planned, including more farming! Thanks to my friend Simo0o for the ideas! Thanks for checking the mod out! For any suggestions on other things I should add to the mod, write in the comments down below! Everything currently in the mod is explained in the section above this text. As long as you credit me and put the mod's link in the credits, you can use it. great mod sofar! i uploaded a nice little mod spotlight for you. it should be done uploading by the time you see this comment. Thanks for reviewing the mod! The video is now at the top of the mod page! ,emerald,emerald_block,pork,steak,chicken,golden_nugget(chicken_nuggets lol),apple,golden_apple,the powerful type of golden_apples, lapis_lazui,lapis_lazui_block, you could also support any popular mods example aether mod, divine_RPG,exc. Not realistic I know; Minecraft doesn't have to be realistic though. To make this mod not op you could make those seeds take much longer for them to grow and definitly make my suggested seeds very rare than wheat seeds. I already said this before but great idea!!!!! I have planned some more neat features, but I am not going to spoil anything! Keep an eye out! This is a awesome mod!!! When I first saw the title, i thought they were world seeds! LOL. Thanks for liking the mod! If you consider making a video on it, you can PM me and I will feature it here, on the post. If I make a video for this, would you put it up on the post? P.S. Making a video anyway! NEver mind, it keeps crashing my game. I don't know why but I did like it while it lasted!! Crashing? Is this the only mod you have installed? Yeah, Ive tried every trick I know. But what I did play was great! Can I use this in a mod pack for a survival map/world that I am making? I'll be sure to give you credit. Reply to my comment or PM me please. Sweet mod! The mod isnt aiming to be realistic. It's a helpful and survival friendly mod. 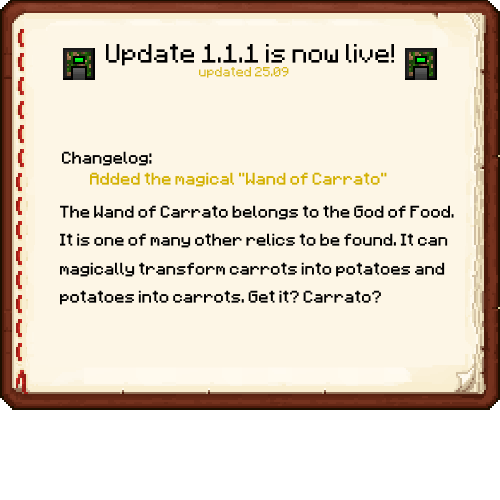 Well, potatos and carrots already act like seeds.. Why not just make the grass drop them? 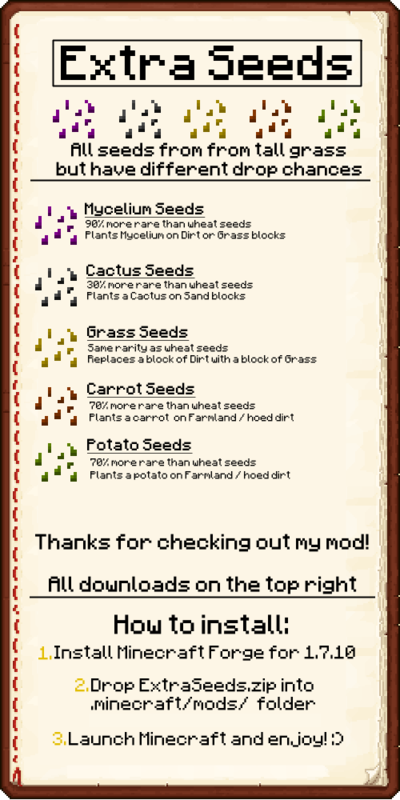 great mod but you should make the potatoes and carrot seeds more rarier than wheat seeds because if they do get a potatoe/carrot seed/combined they can basicaly get enough supply of food source. Which can make minecraft a little bit boring in my opinion. Hmmmmmmm................ maybe 300% more rarier than wheat seeds. You could change it how you like if you fill like it isn't OP/UP (underpower if you didn't know that. Not a 1-up mushroom lol; I know you wouldn't think that :P ). 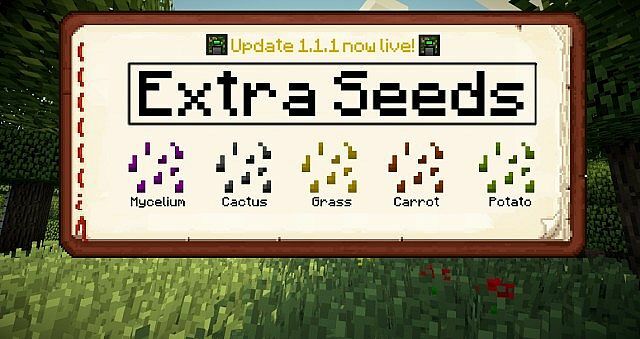 I also think that you should make the glass seed take some time for it to grow to make it so it turns to a grass block instead of instantly. 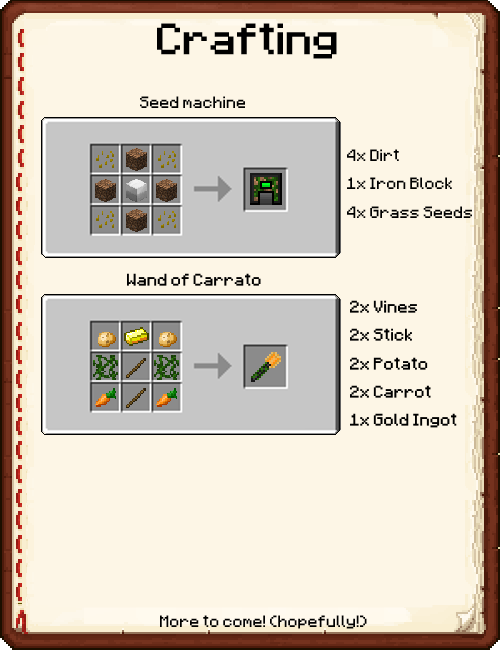 Potatoes and carrots are a lot more rare than wheat seeds. 100% - impossible to drop, 70% - really rare. That's what I meant. Hope that clears things out! I'm glad that you're enjoying the mod! Oh ok that makes sense. Thanks for explaining though but I still think that you should make grass seeds take sometime to grow instead of instantly. [Program] Minecraft Skin Stealer - EASY way to Download Player's skins!